H’s session must take place at some time before Z’s session. I’s session is on Thursday. K’s session is always scheduled for the day immediately before or the day immediately after the day for which O’s session is scheduled. Neither Monday nor Wednesday can be a day for which two students are scheduled. Which one of the following is a pair of students whose sessions can both be scheduled for Tuesday, not necessarily in the order given? If K’s session is scheduled for Tuesday, then which one of the following is the earliest day for which Z’s session can be scheduled? If U’s session is scheduled for Monday, H’s session is scheduled for Tuesday. If U’s session is scheduled for Tuesday, O’s session is scheduled for Wednesday. If U’s session is scheduled for Wednesday, Z’s session is scheduled for Tuesday. If U’s session is scheduled for Thursday, Z’s session is scheduled for Friday. If U’s session is scheduled for Friday, Z’s session is scheduled for Thursday. Scheduling Z’s session for which one of the following days determines the day for which U’s session must be scheduled? If H’s session is scheduled as the next session after U’s session, which one of the following could be true about H’s session and U’s session? U’s session is scheduled for Monday, and H’s session is scheduled for Tuesday. U’s session is scheduled for Thursday, and H’s session is scheduled for Friday. They are both scheduled for Tuesday. They are both scheduled for Thursday. They are both scheduled for Friday. 1) Which students must, can, or cannot be scheduled for which days of the week? 2) Which students must, can, or cannot be scheduled consecutively with which other students? 3) Which day of the week gets two students, and which students are they? 2) No reason not to jump right to the most concrete rule of the bunch: Student I’s on Thursday, so build that right into the sketch. 1) Standard sequencing fare: H . . . Z should help us to remember this. You should make a mental note, however, that due to the slight wrinkle (the two-student day), this rule does not necessarily imply that H’s session will be on an earlier day of the week than Z’s. It must come “some time before,” which leaves open the possibility that H can be the first student of the two-student day with Z’s lesson later that day. 3) Here’s the more standard adjacency type of sequencing rule that we’re used to: K and O must fall on consecutive days of the week, in either order. KO or OK will remind us of this. 4) Monday and Wednesday will have one student, so the two-student day will be either Tuesday, Thursday, or Friday. Key Deductions: Not much to combine here, is there? Notice how no entity appears in more than one rule, a fact that makes it less likely that a big deduction will exist. Trying out a few scenarios leads to the conclusion that the possibilities are not very limited thus far, which means that our best bet is to move right on to the questions. is a valid ordering, confirming (D) as the pair that could be scheduled for Tuesday. This ordering takes care of the stem and satisfies all the rules, proving that Tuesday, choice (B), is the earliest day for Z under these circumstances. (A) If U is on Monday, does H have to be on Tuesday? The test is to see whether we can place H on some other day. 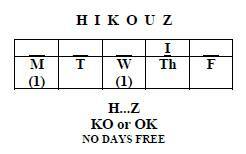 And we can: If K and O are on Tuesday and Wednesday (in either order), then H can be on Thursday with Z on Friday. So (A) need not be a true statement. (C) With U on Wednesday, K and O can take Monday and Tuesday, leaving H and Z for Thursday and Friday, respectively. So U on Wednesday does not force Z into Tuesday, and we can cross off (C). (D) is all that’s left, so it must be correct. For the record: With U on Thursday, the KO pair must be scheduled during two consecutive days between Monday and Wednesday. To get H before Z, H must take the leftover day before Thursday while Z is slotted for Friday. (B) With U doubling up with I on Thursday, it’s not possible to put H on Friday and still have H’s session before Z’s (Rule 1). Sure, we could put Z later on Friday, but then we’d have two two-student days, in violation of the numbers rule in the intro. (C) Scheduling both H and U on Tuesday causes the same problem we saw back in Q. 1—there would be no way to place the consecutive KO pair without doubling up somewhere else. (D) With I already on Thursday (Rule 2), placing this pair there would result in three Thursday students. No good. (E) If H and U were on Friday, then Rule 1 would force Z onto Friday’s roster as well, overburdening the poor coach with three Friday lessons. Again, no good.